More than 10 years ago, the Waikato Regional Council became concerned about the effects of increasing catchment loads of nitrogen on the water quality of Lake Taupo. Calculations showed that most (>90%) of the manageable nitrogen entering the lake came from areas of pasture in the catchment. A variation to the Waikato Regional Plan was developed, and was finally confirmed by the Environment Court in July 2011. The Plan aims to maintain the lake’s current water quality well into the future (“by 2080”), by managing loads of nitrogen in the catchment. It aims to do this by (1) capping all manageable sources at their 2001 levels, and (2) reducing some of the manageable sources to offset much of the historic load from land development that is stored in groundwater and is thus still in transit to the lake. The Resource Management Act provides the authority for the Plan’s rules that cap the existing loads of nitrogen, while a public trust – the Lake Taupo Protection Trust – was set up under the Local Government Act to use public monies to offset the historic loads. The farm-scale nutrient budget model OVERSEER® was used to determine the recent (2001–05) discharges of nitrogen from areas of developed land in the catchment, resulting in “Nitrogen Discharge Allowances” for each farm. These vary – generally depending on the intensity of land use in each case – with the average value for pastoral land in the catchment being about 17 kg N/ha/yr. The combined Discharge Allowance for pastoral land in the catchment is about 880 t N/yr. Each farm in the catchment has now been issued with an individual “consent to farm” that specifies the Discharge Allowance for it. And farms must be operated within this Allowance. About 80 consents to farm have been issued. The Council has developed a risk-based ranking, and is auditing the 60 highest priority farms each year, with a further 20 farms being audited every three years. This is done using the farm accounts that are routinely prepared for tax purposes. The Office of the Auditor General oversees this auditing. 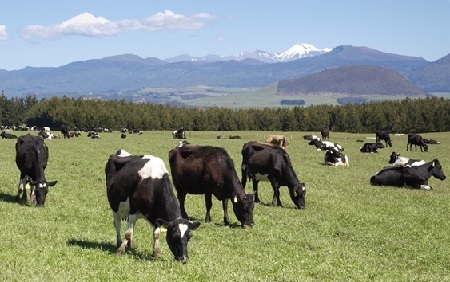 Taupo’s catchment includes a variety of land sues, including dairying and forestry. Under the Plan, Nitrogen Discharge Allowances may be traded, with the resulting changes being recorded against the land title. The Lake Taupo Protection Trust has purchased Discharge Allowances totalling about 150 t N/yr, while a dairy operation has purchased 17 t N/yr. The Trust’s purchases have enabled it to pursue its strategy of reducing the future load of nitrogen entering the lake so as to offset much of the historic load that is yet to enter the lake. As part of this, about 58 km2 of pasture has been converted to forestry, and recorded on the relevant consents. The Auditor General pays particular attention to operations where public money has been spent. Over the past 10 years (2003–12), the load of nitrogen entering the lake in the inflowing streams has increased at a rate of about 1% per year (while the load of phosphorus has decreased). Increases like this were anticipated in the Regional Plan, and are consistent with our understanding of the storage of “old” nitrogen from historic pastoral land uses in the groundwater. However, about half of the overall increase in nitrogen loads was carried by streams draining areas of mostly native bush and forestry, and this is somewhat unexpected. We have recently commissioned two analyses of historic aerial photos of the land in the eastern part of the catchment that is now covered in pine forest. Photos from the 1950s and 1960s of land that is now covered with more than 450 km2 of pine forest – about 60% of the total area of pine forest in the lake’s catchment – show that about one-third (31%) of this is planted on land that was previously in pasture. It is likely that the pre-plantation history of land use in this area is at least partly responsible for the recently-observed increases in the nitrogen loads carried by the streams that drain it. These increases suggest that the nitrogen load that is still to enter the lake from historic land use practices is likely to be larger than was previously predicted. Bill Vant is a water scientist and Jon Palmer is a senior resource officer at Waikato Regional Council. Could you clarify a couple of issues in this excellent post? Are the purchases of discharge allowances by the Lake Taupo Protection Trust off farmers who’ve been allocated consents? Could you explain a little more about the sources of Nitrogen for the pre-plantation phase? Yes, and only from those who have consents (as opposed to those operating under the permitted activity rules). So (1) Council identifies the Nitrogen Discharge Allowance, (2) it then issues a consent, and then (3) parties – including the Trust – are free to engage in trading. Analysis of the photos shows that 139 km2, or 31% of the currently forested area, was historically in pasture. It now seems likely that some of the nitrogen discharged during the farming of these areas has been stored underground for several decades, and has only recently begun entering the rivers that flow into the lake. This is consistent with our tritium measurements that give an the average age of 38 years for the water in one of these (the Waitahanui River). Interestingly the OECD assessment of Nitrates in lakes over 2002-2004 has Lake Taupo the lowest of the 41 lakes assessed globally. I find it hard to believe that pre-plantation historical areas of pastures are continuing to speed up their loss of N (supposedly from the organic N pool) as time progresses. It doesn’t fit the logic test (my logic at least). My logic being – pastures build up organic N. When a pasture is removed the organic pool of N declines. The rate of mineralistion of N into the labile pool is correlated to the amount of organic N. As organic N declines so too does nitrate loss. And this happens over time. My suspicion would be directed towards the forestry itself. My understanding is that exotic forestry is generally low in N loss, comparable to Native forest. However there is a relatively high range of N loss from forest to forest (a range approx. double that of native forest, and about 80% of the range of pastures). As far as my reading has allowed, I can find little information regarding the factors affecting N loss from forestry. I have questions around age, soil type, management, environment etc. All we know is that some forests can lose plenty of N. I wonder if this has been considered. If not considered, I would encourage some research into this. Yes, Lake Taupo water does indeed have low concentrations of nitrogen. And Council’s plan is to maintain that situation. We also know that the forested areas of the Taupo catchment generally discharge low loads of ntirogen, measured at about 2 kg/ha/yr at relevant sites. I’m suggesting that the increases we’ve recently seen are less to do with any changes in the mineralisation of organic matter associated with historic pasture, and more to do with the unusually long-term storage of nitrogen from this source in the groundwater in the freely-draining volcanic soils in the area. What doesn’t make sense to me is why the mineralisation of the organic N is speeding up. Not only should is slow down with time but I would expect that the carbon deposition by the exotic forests should ensure that nitrogen is sequestered at a rapidly increasing rate. Reducing the pool of soluble nitrate. Your suggestion is a curiosity to me.